Looks like the flops just keep on coming as Pyaar Impossible and Dulha Mil Gaya joined Accident on Hill Road, Raat Gayi Baat Gayi and Bolo Raam in the box office duds category. Trade analyst Vinod Mirani gives us the box office verdict. Note: Films are ranked according to their release dates. The thumbs ups and downs reflect rediff's views. Cast: Celina Jaitley, Farooque Sheikh, Abhimanyu Singh. Unnecessary songs, terrible dialogues, poorly-made film. Cast: Rajat Kapoor, Vinay Pathak, Neha Dhupia. 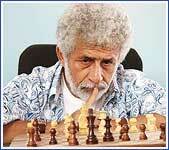 Cast: Naseeruddin Shah, Om Puri, Padmini Kolhapure. Cast: Aamir Khan, R Madhavan, Sharman Joshi, Boman Irani and Kareena Kapoor. Excellent performances, very well directed film. 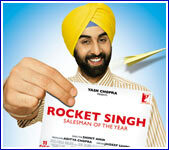 Cast: Ranbir Kapoor, Shazahn Padamsee, Prem Chopra and Gauhar Khan. Cast: Amitabh Bachchan, Abhishek Bachchan, Vidya Balan. Touching story, Amitabh Bachchan excels. Cast: Himesh Reshammiya, Shenaz Treasurywala, Sonal Sehgal. Himesh tries too hard, poor dialogues. Cast: Akshay Kumar, Katrina Kaif, Neha Dhupia, Paresh Rawal, Johnny Lever, Rajpal Yadav, Asrani, Shakti Kapoor and Archana Puran Singh.